So, it’s summertime for the solo, and surprisingly, the selling is easy. At least, I’ve always thought so. For starters, lots of law practices slow down, what with clients, other judges and lawyers on vacation and many lawyers have time on their hands. 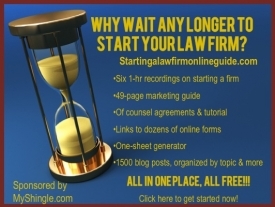 Moreover, with the economy in its current state, it’s a buyer’s market for hiring motivated law students who can help you with a variety of marketing ideas that you may have put off – like a law review article, webinar or starting a blog. Plus, working with a law student during a summer lull gives you a chance to flex your delegation muscles without the pressure of critical or imminent deadlines. Summer is also conducive to reconnecting with colleagues. Because of the less hectic pace, you should be able to enjoy a few leisurely outdoor lunches, or break away in time to make a 5 pm happy hour. If you’re more ambitious, you might try inviting a group of your office mates or listserve colleagues to a baseball game or organize outside activities like a hike or volleyball or ultimate Frisbee. Of course, summer’s greatest enticement – a slower pace and relaxation – is also its greatest drawback, because it can make us less disciplined. If that’s your problem, here’s a neat tool that can help. Part of David Seah’s terrific suite of FREE Productivity Tools, this Network Rainmaker will keep you on task by creating a point system to keep you accountable on leads, information exchanges and follow-ups. I’m headed out on vacation but when I return, I’m going to give this system a test-drive. I’ll keep you posted on my progress (I hope!) – and feel free to download your own copy of the form and join me for the ride.